As the deadly bat disease called white-nose syndrome continues to spread across North America, scientists are studying bats in China to understand how they are able to survive infections with the same fungus that has wiped out millions of North American bats. By comparing disease dynamics in North American and Asian bat populations, researchers have found evidence that Asian bat species have much lower levels of infection than North American species and therefore are resistant to the fungus. The study, published March 9 in Proceedings of the Royal Society B, also suggests that some declining North American bat species may be able to evolve enough resistance to the disease to persist, while other species appear less likely to do so. 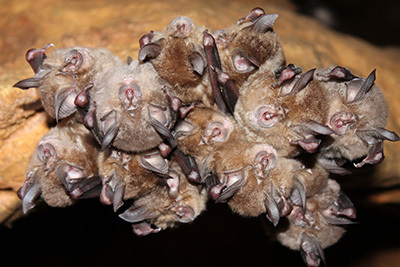 Led by researchers at the University of California, Santa Cruz, an international team sampled hibernating bats at five sites in China and five sites in the United States, using a standardized swabbing technique to detect and quantify the amount of fungus on each bat. 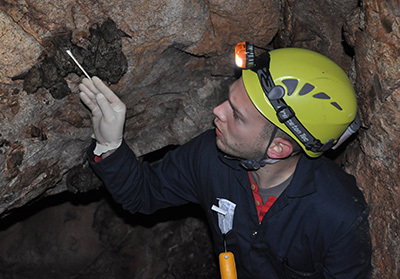 "Uniformly, across all the species we sampled in China, we found much lower levels of infection--both the fraction of bats infected and the amount of fungus on infected bats were lower than in North America," said first author Joseph Hoyt, a graduate student at UC Santa Cruz. 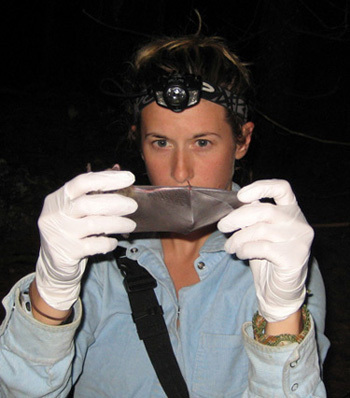 Co-first author Kate Langwig, a former UCSC graduate student now a postdoctoral researcher at Harvard University, said the team collected samples from bats at hibernation sites in Northeastern China and the Midwestern United States where the latitude and winter climate are very similar. The fungus that causes white-nose syndrome is endemic in Asia and Europe, so bats there have coexisted with it for a long time, whereas the disease only recently invaded North America, where it was first discovered in 2006. "This is the first study to compare disease dynamics in an endemic region and a region where the pathogen is invading, and the results can help us understand the course it might take in North America," Hoyt said. The researchers considered four possible hypotheses for the ability of Asian bats to persist with the fungus: host resistance, host tolerance, lower transmission due to smaller populations, or lower fungal growth rates due to environmental factors. Their results pointed toward host resistance and did not support the other hypotheses, Hoyt said. The variation in infection intensity observed within some North American species, such as the little brown bat, may be a hopeful sign, he said. 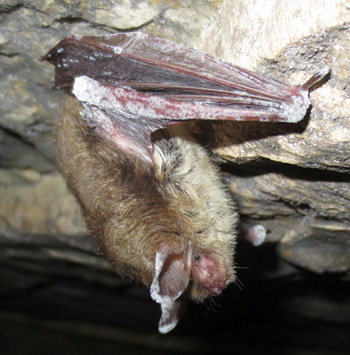 Overall, little brown bats had much higher levels of infection than Asian bats, but some individual little brown bats had relatively low fungal loads. If the variation is a result of genetic differences, it could lead to the evolution of resistance in that species. Langwig noted that one North American species, big brown bats, have not suffered as dramatically from the disease as other North American species. In contrast, northern long-eared bats, which showed very low variability in fungal loads, have experienced drastic population declines. "The northern long-eared bat suffers really high fungal loads, and nearly all individuals are infected--there's no overlap with the Asian species," Langwig said. "From previous work, we've seen their populations crashing toward extinction, so it could be a poor omen for that species." The mechanisms underlying the resistance of Asian bat species remain unknown. "It doesn't have to be the same strategy for every species--it could be differences in the skin microbiome in one and hibernation behavior in another--but we just don't have those details yet," Langwig said. In addition to Hoyt and Langwig, the coauthors of the paper include Winifred Frick and Marm Kilpatrick, both faculty members in the Department of Ecology and Evolutionary Biology at UC Santa Cruz; Keping Sun, Guanjun Lu, Tinglei Jiang, and Jiang Feng at Northeast Normal University, China; and Katy Parise and Jeffrey Foster at University of New Hampshire. This work was supported by the National Science Foundation, National Speleological Society Rapid Response Fund, U.S. Fish and Wildlife Service, China National Science and Technology Foundation, an Experiment.com crowdfunding project, and the Robert and Patricia Switzer Foundation.